Coming soon July, 2017! The RAIS Viva L 100 & 120 GAS stove series is iconically round, streamlined, and offers the beauty of Scandinavian simplicity. Unrivaled, beautiful flames with a wide viewing area. Optional side glass available to extend the view. Choose colors between black, and platinum or nickel to match your decor. Truly convenient by turning on the heat with the flick of a button. Remote control start comes standard and is wall thermostat compatible. Light immediately, anytime! The flame height can be adjusted with just one click. Standard for LP fuel with propane assembly kit included. Advanced auto-light pilot for easy lighting. Now comes standard with safety screen for your child's protection. 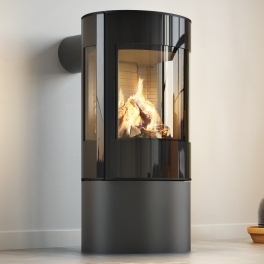 This beautiful stove is available in black or platinum, or nickel and in two heights (100, 120). Optional top plates for both rear, and top exit include: standard thin, 2" deep, stainless-steel, soapstone. The stove is shipped for use with natural gas but can be easily converted for use with propane (LPG) and the conversion kit is included. With a heat output of 31,000 Btu, Viva L Gas stove from Rais is an efficient heater that can even operate during a power outage. Whether it is top or back vented, the RAIS Viva L Gas requires only a 2 inch clearance to the back wall and a 6 inch clearance to the side walls. RAIS, Inc. has spent 35 years developing elegantly designed high-quality stoves and inserts that are not just an economical heating source but also a visual experience that raises the breathtaking vista of the flames to an expression of art.